When a Henry .44 Rem Mag rifle (H006) appeared on my horizon, well, eclipse or no eclipse, it had to be taken for a ride. 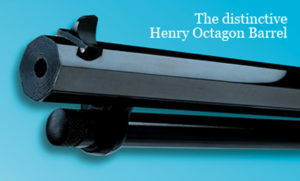 Henry advertises this as one of the “Henry Big Boy .357/.44 MAG/.45 Colt Rifle”. 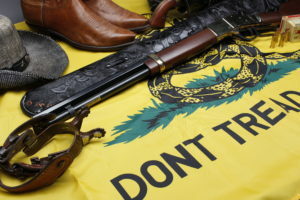 This is a true compliment to Benjamin Tyler Henry and the Henry Repeating Arms Company he started in 1860, when, like today, civil strife threatened to ignite a civil war. 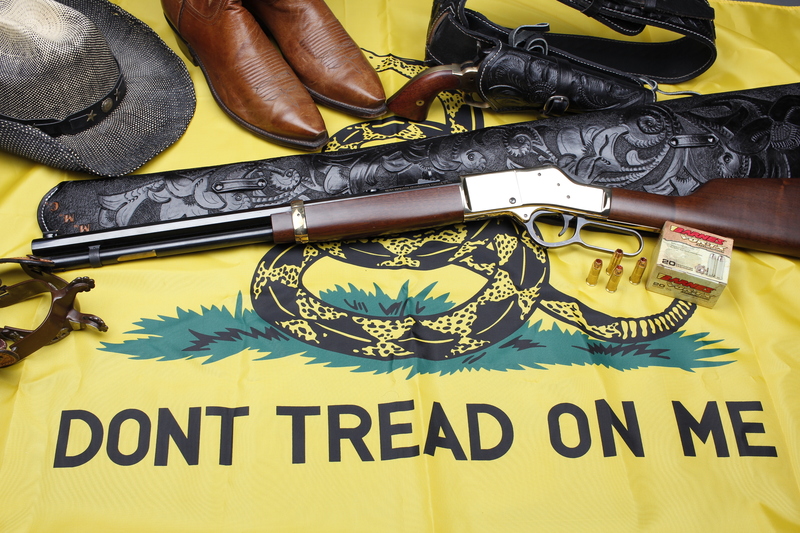 This rifle is as pretty as any “Yellow Rose of Texas” and just as mean and SASS approved. While this one is chambered for the .44 Magnum it can also fire the .44 S&W Special, though I do not recommend using wad-cutters in this rifle as they may jam in the slide-feed. One did when I took it out on the range. They specifically recommend that you NOT use Blazer or other aluminum cased ammunition, who could blame them. The octagonal barrel and brass finish make this a beautiful wall mount as well as very much at home in a saddle scabbard. Sling mounted it is an easy carry at 8.4 lbs. loaded. “The traditional 20″ octagonal barrel is outfitted with a classic fully adjustable semi-buckhorn rear sight with a reversible white diamond insert and a brass beaded front sight.” – Henry. They worked very well at 100 yards and at 150 yards. At 200 yards it was a little bigger grouping, so to speak. I suspect the .44 round would not do well in heavy brush, but for deer hunting at 150 yards, this will fill your freezer. 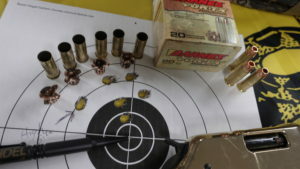 One other “plus” could be, if you carry a .44 Mag pistol as your back-up gun, then only one caliber of ammunition to haul and I am all about easy. Then again, my 44 magnum pistol can only be described as “unpleasant” to shoot. I was shooting the Barnes VOR-TX 44 Rem Mag 225gr., XP HP, hollow-point, muzzle rated by the factory at 1,275 fps. 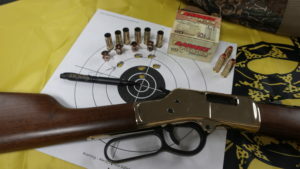 Since the 44 magnum is such a popular pistol caliber most ammunition dealers, brick & mortar or on-line, only carry the wad-cutters and hollow-points. Grizzly does make a 300gr. Bonded Core Jacketed Flat Point. I may get some of these and test them on a ballistic gel dummy for a future post. Due to the range backdrop I was able to recover four (4) of the slugs, pictured above. I was surprised that none of them “spread” as advertised. The upside is they stayed together which would make processing the meat of a kill an easier task, the downside, and this is conjecture because I don’t have law-enforcement caliber ballistic analysis equipment, is I would suspect any exit wound would not be where one would expect it, and a perfect shot to the heart might deviate just enough to actually miss the organ and leave me chasing down a wounded and suffering animal. No hunter wants that. More tests on the ammunition are warranted. As for the rifle, “Made in America” by Americans, this is still a classic and a great addition to anyone’s collection. Previous articleThe New Way to Stick it to PALS! Next articleWhen “2 out of 3” is Still an Improvement!